The best round brushes smooth, but don't snag. They volumize but don't humidify. Bottom line: they give you the style you want and they don’t take too long to get it done. We researched lots of the best options in a range of styles and materials. Before we bring you straight-from-the-salon style, here’s what you need to look for when you shop. The best round brush for you could be waiting right here! Hair - Some brushes are crafted for specific hair types: thin, ethnic, straight or curly. Others work for everyone! This simple breakdown will assist you in selecting the brush that makes sense for your blowout, your prom updo, or your go-to party look. 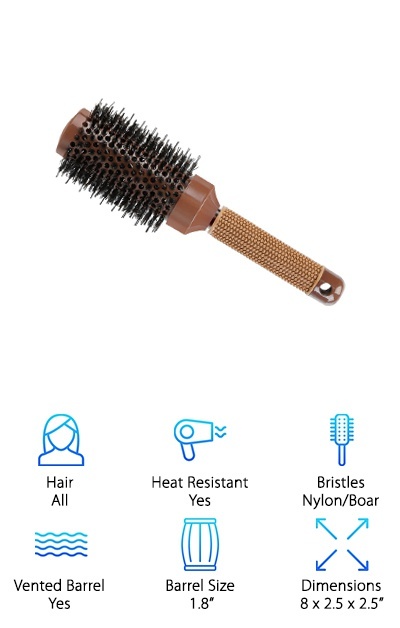 Heat Resistant - Will the brush you pick work with your hair dryer, and are you trying to avoid any possible heat damage? Some of the brushes on our list come with heat-resistant features, and some are used for other kinds of styling. Bristles - With all of the bristle choices out there, it’s good to know which ones top the perfect brush of your dreams. The best round brush for thin hair might stimulate the scalp, while a different brush focuses on reducing frizz. Vented Barrel - All brushes are not created equal, and the vented barrel brush is primarily used for drying hair. The vented design helps with airflow. If you’re going to be pairing your brush with your hair-drying routine a lot, take note. Barrel Size - Do you want tight curls or beachy waves? Believe it or not, the size of the barrel on your brush is one of the first steps toward getting the look you want and working with your current hair length. Dimensions - You want a brush that works for your style, and size does matter. We’ll help you get a grip on what’s available! Let us help you volumize the information available to you. We’re sure it’ll blow you away! Now that you know what to look for, it’s time to make a selection. Here’s the deal: these are some of the best barrel brushes around! Get ready to look fabulous, no matter your hair type. We’ve got a wide range of round brushes ready for browsing. If you’re in a hurry, however, we totally get it. Just take a look at the top pick and the budget pick to see if they work for you. Let’s go! The 1907 Copper Core Series is certainly a set to be reckoned with. 6 different brushes, ranging from a 1.5-inch barrel to a 2.5-inch barrel, means you’ve always got the right brush within your reach. 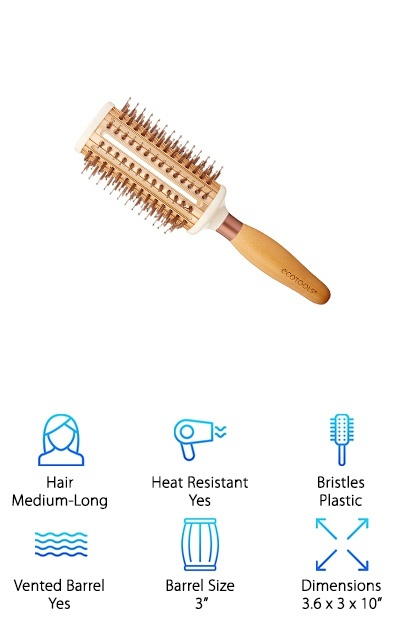 These brushes are anti-microbial, and they promise to get your hair dry faster thanks to that copper core. They are designed to work with all types of hair, so if you’ve got frizz or very fine hair, this could be the resource you need. Made with both nylon and boar bristles, these brushes might be the complete package. The experts say natural bristles can contribute to healthy hair growth. The best round brush for short hair… the best round brush for long hair… you just want a set that gives you a prerogative and great results! The Fromm Copper Core Brush Set won’t break the bank, and variety in style and fashion is right there at your fingertips. Try it out today! Remember that machine on the Jetsons cartoon that let you step inside, and then step out with the perfect outfit and hairdo? The future really let us down in that regard, didn’t it? The Minalo Anti-Static Round Brush can help ease your existential pain, however, with its sharp design and intuitive features. This lovely brush is definitely on the “best round brush for blowouts" list thanks to its large, 2-inch barrel size. Nylon bristles are designed to hold onto your hair efficiently as you get ready for work or a night out. 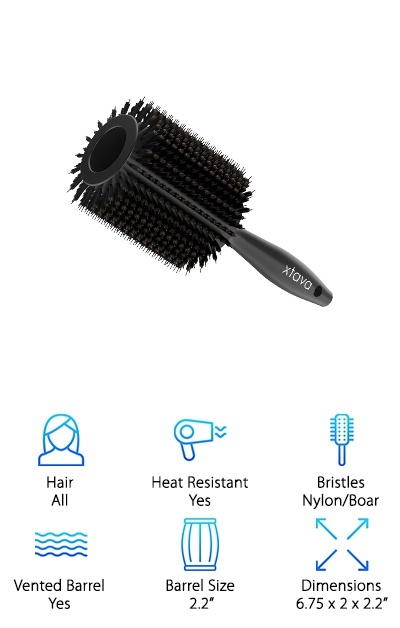 And speaking of blowouts, this brush is indeed intended to be used with heat when necessary. It's heat resistant up to over 350 degrees Fahrenheit! Wow! And the barrel is vented for optimal airflow. That feature can also add more shine as it tames flyaways. After all, you really have no time to waste, dealing with hair that won't behave. Get it in line with the Minalo Round Brush! The Xtava Brush for Blow Drying could be your blowout’s new best friend. A more affordable option than the typical salon blowout, this brush sports a classic design: an ergonomic wooden handle, and a large 2.2-inch-wide barrel. Other sizes are also available! There are two kinds of bristles combined on the brush, nylon, and boar. Together, the two can detangle and smooth frizz. The best round brush for volume also needs to be able to pick up and gently hold hair of all sizes and shapes, and this brush is a contender. The great debate in the styling world always goes back and forth over A) what makes a great brush and B) what makes a great blowout. We don’t have the answers, but this brush could get you in the running to offer your own. Even better: the brush is heat resistant with a vented barrel, just what you need to rock your hairdo. So, what are you waiting for? Gold is the color of wealth, royalty, and seriously great hair. At least, it is when you’ve got a gold Suprent Nano Barrel Brush in your styling arsenal. The best boar bristle round brush can help to create loose curls and waves in longer hair and straighten and smooth out shorter hair. Let's see if this Suprent brush can do that for you! If your hair is on the shorter side, you might be wondering: "Is investing in a round brush even worth it?" The answer is YES. Quality brushes can help straighten and smooth even short hair and help with the blow-drying process. The Suprent brush comes in a 1-inch barrel size, perfect for short hair. It is also available in 1.3-inch and 2-inch widths. It gets better: It is designed to be used with heat. It's both highly heat-resistant and has a vented barrel for proper airflow. Get the movement in your hair you’ve always wanted! Where can you find the best boar bristle round brush for fine hair? You might want to start with something like the Y.S. Park Curl Shine Styler. This round brush is made with both boar bristles and polyamide pins added to serve two different functions. The bristles are there to add gleam and shine, and the pins should gently detangle and hold. Extremely coarse and curly hair could benefit from this combo, as could fine thin hair. Made for hair of all types, the brush is ready to go to battle with your hair dryer. It's designed to be resistant to heat and has a vented barrel for air flow. Or, if you just need a little quiet “me” time, this brush can serve as masseuse and therapist. Just start brushing away! All jokes aside: this is a light, fashionable brush. Whether your ultimate look is a beehive or a side pony, the Y.S. Park Styler is here to help. This next pick of ours is a bigger brush for bigger hair: medium-to-long hair, specifically. The Ecotools Hairbrush is designed as a more open brush than others, to detangle and grip long hair, and not tug. The thinner, more spaced-apart plastic bristles also help with the task. Here's the deal: those thermal ribs you see on the brush are designed to do a lot, including preventing breakage. In addition, they’re there to assist with blow-drying and any other heat styling you have to do. There’s also the vented and heat-resistant recycled aluminum barrel, all there to get you ready and out the door faster. All you’ll need after this is a butler to make you your coffee! And a maid. And a personal chef. Are we taking this fantasy too far? 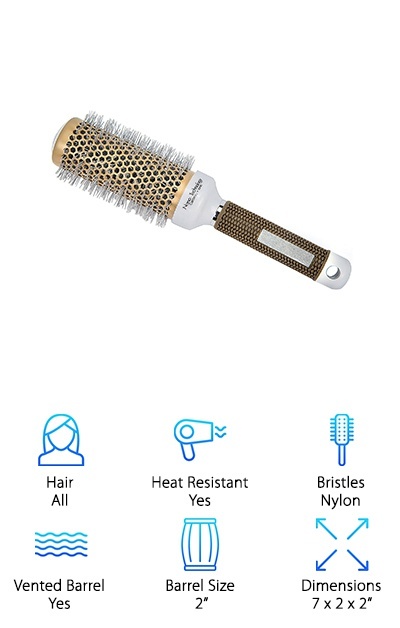 Well, whether all of those things happen for you, one thing is for sure: your hair is going to look great the entire time with this brush. So stimulating: the Kaiercat Brush duo stands out for their all-natural boar bristle features. The brushes, one designed for short hair and the other designed for long hair, make a fabulous combination at an affordable price. 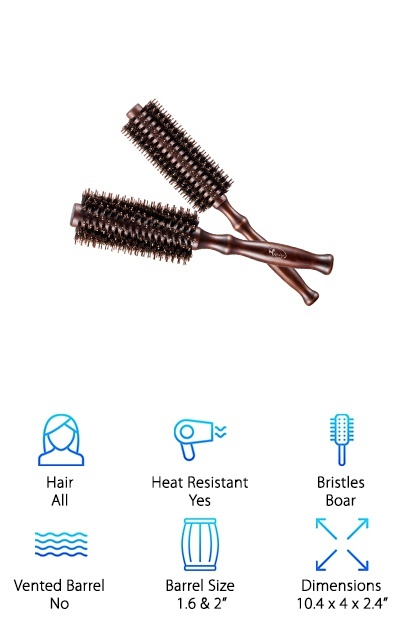 Those boar bristles massage the scalp and can keep it healthy, as the brushes help with curling, straightening or drying hair. The wood handle is made for gripping, with an overall highly ergonomic style. Now get this: by using these brushes regularly, you could see softer, smoother hair emerge! If you’re not impressed with your current styling options, we totally get it. Sometimes you need to shake things up and check out something new. Round brushes made with boar bristles can help you reap some serious benefits (and awesome, controlled hairstyles.) Aren’t you curious about your hair potential? Add more bend, add more curl, add more shine or add more control. Anything is possible with the right brush in your hands! As anyone who has ever searched for a hair product knows, the number of choices is truly dizzying. Aisle after aisle of products promise the hair of your dreams. What’s tough is finding something out there that really does work for all types of manes. 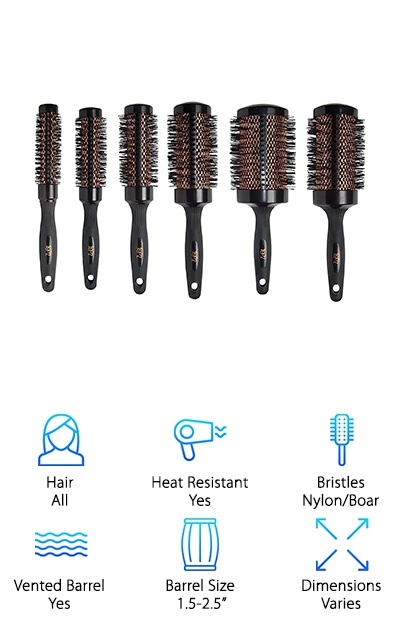 The makers of the YaFex Boar Bristle Brush say this brush is for everyone, whether you have fine or thick hair, curly or straight. And as we now know, brushing hair does a lot more than just making you look presentable for work. Proper maintenance can make hair and the scalp more healthy, detangle, groom, and provide the optimal environment for styling. Here’s the kicker: it can make you look even more fantastic, too! 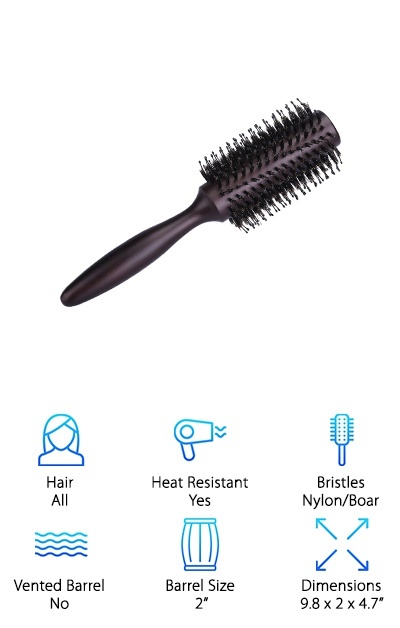 This item checks off plenty on the “most-wanted” list we came up with for round brushes: heat resistant. Dual boar and nylon bristles for gripping and smoothing hair. And a 1.8-inch barrel size for holding both short and long hairdos! Even the most unruly hair can fall under the spell of a proper boar-bristled brush. 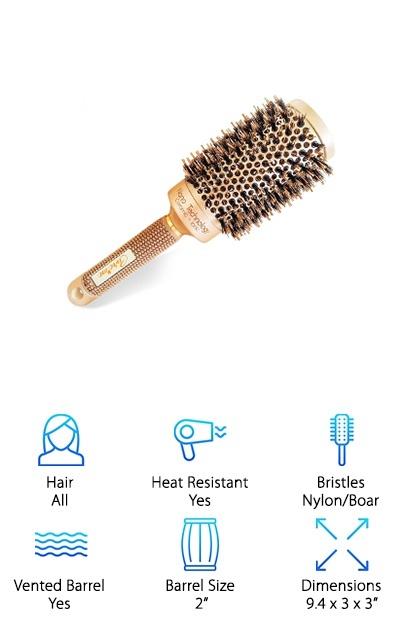 The Care Me Brush for Blowouts is a golden beacon of hope for you ladies and gentlemen struggling with a little frizz! It can be used for curling, straightening or blowouts. Use the generously-sized 2-inch barrel for subduing problematic hair or adding volume to fine, thin hair. The vented ceramic barrel will help to distribute the airflow from your hair dryer, which could mean less time spent getting ready and more time actually out and about. Pretty good, right? 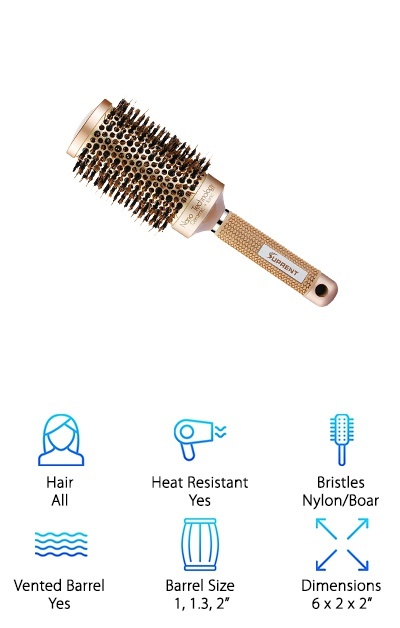 Even better: the combination of nylon pins and real boar hair bristles means your hair can be held and smoothed, with the boar bristles helping to distribute natural oils from the scalp. This is a salon-quality instrument that you can use in the comfort of your own home. Feel free to put a plant in the corner, and play soft jazz to add to that salon mood! The HOMEIDEAS Boar Bristles Brush is one of the larger brushes on our list, at nearly 10 inches long. That’s a great advantage for men and women with all kinds of hair, seeking a better handle on things. The curved wood helps you to get a grip and moves the nylon and boar-bristled brush through short or long locks. Straightening, smoothing, volumizing or blow-drying are all doable with the HOMEIDEAS brush! This brush is made for the heat, so don’t worry about using it in your hair-drying routine. If you’re curious about the use of boar bristles on so many of our most popular brush choices, read on. 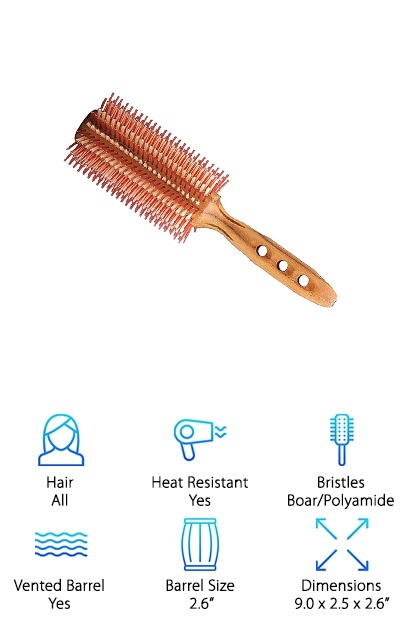 Here’s the deal: Essentially, you can think of boar bristles as natural conditioners. They can increase blood flow in the scalp, and help transport natural oils throughout the hair. This is a larger-barreled brush, too. You can use it to mimic salon techniques and moves for the perfect updo or casual hairstyle.